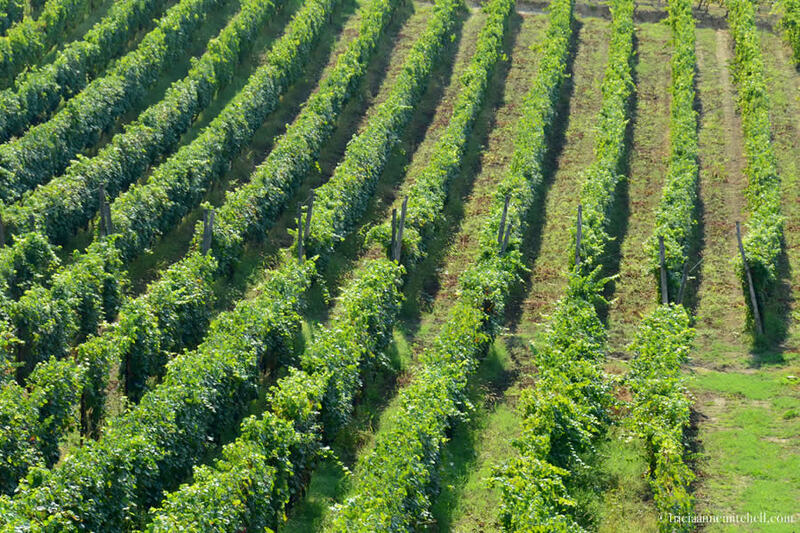 For nearly one thousand years, generations of residents have carefully molded Southern Piedmont’s terrain, sculpting it into the viticultural masterpiece that you see today. 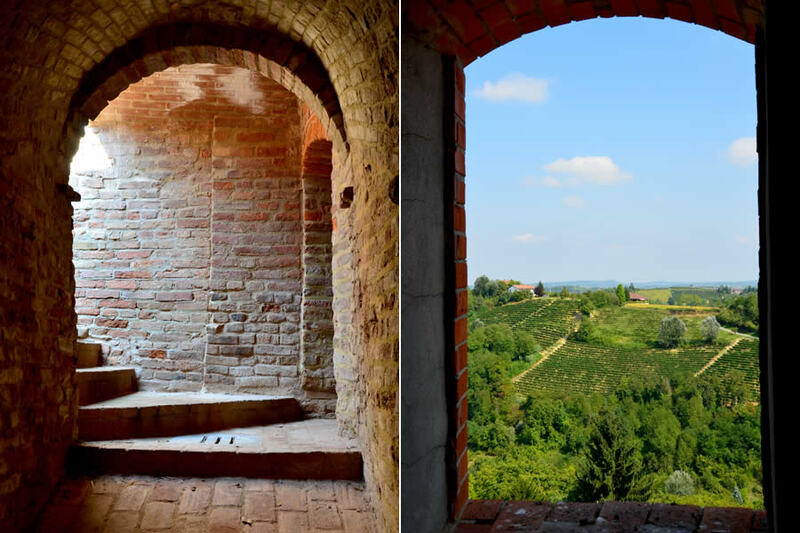 In the summer of 2014, the vineyard landscape of the Langhe-Roero and Monferrato districts was formally recognized when it was granted UNESCO World Heritage status. It was Italy’s 50th site to attain such recognition. 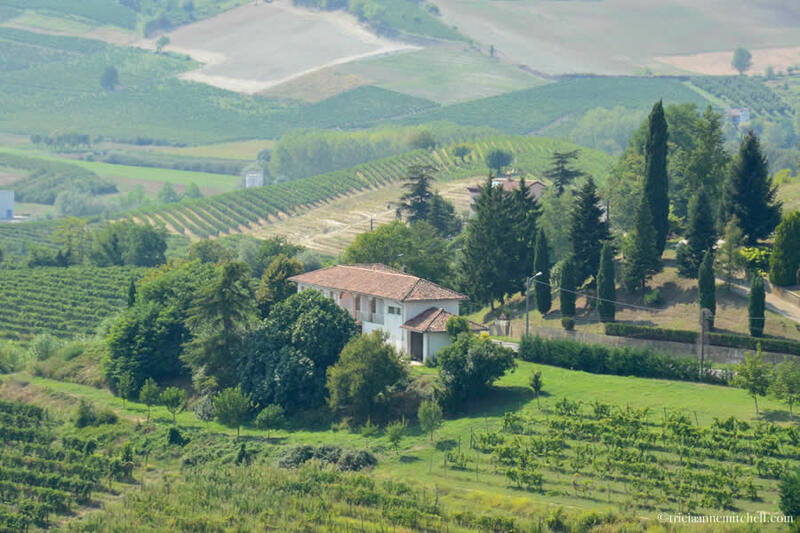 While wine connoisseurs worldwide will undoubtedly recognize Piemonte wine stand-outs such as Barolo, Barbera and Barbaresco, food enthusiasts likely also know that Piedmont was the birth place of Italy’s Slow Food Movement, and home to a rich food culture. 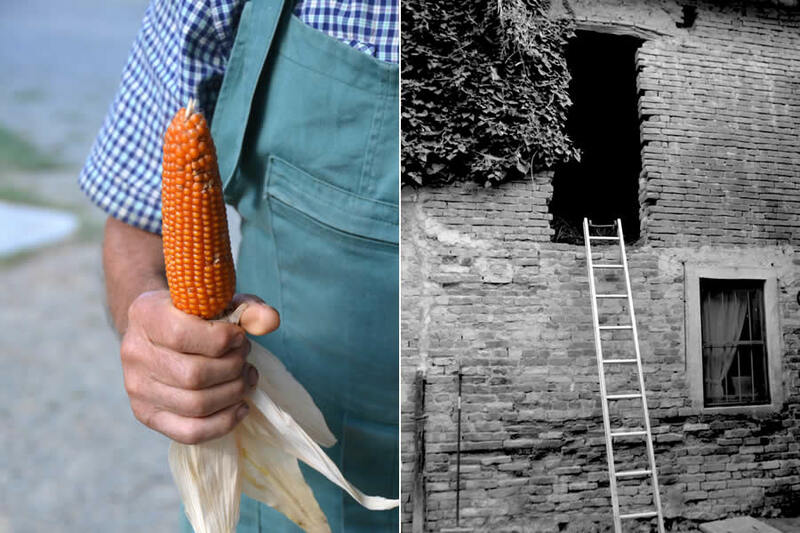 Slow Food — which was started in 1986 to serve as an alternative to fast-food, and to help preserve traditional cuisines — branched out from its Italian roots. It eventually morphed into a global movement that still seeks to promote local, small businesses while encouraging cultivation of regional plants and livestock. 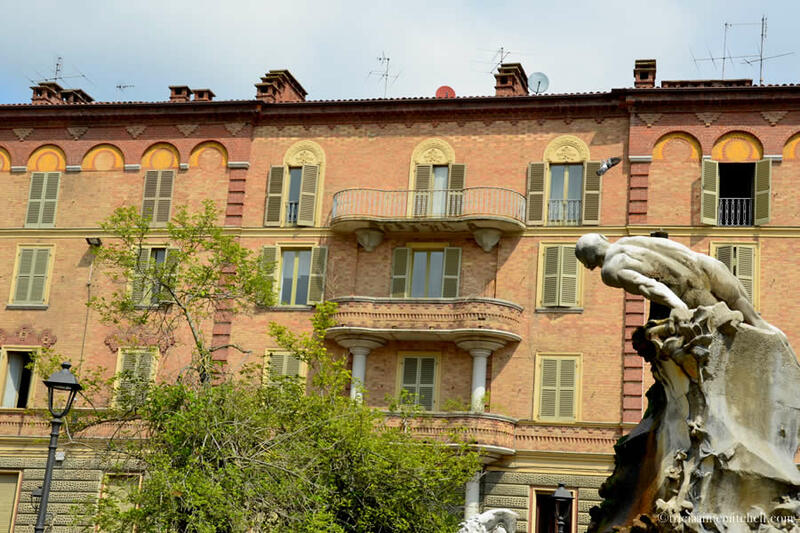 Taking to the cobbled lanes of Asti, Marco enthusiastically focused upon two of the city’s biggest draws: its distinctive cuisine, and its annual Palio festival, a medieval horse race. Visiting in August, we would miss Asti’s September Palio by a few weeks, nevertheless Marco said that the locals’ “anticipation and passion” for the 700-year-old-plus event could already be felt. Pointing to a nondescript road and parking lot, Marco tried to help us visualize how the area is transformed for the Palio race, when 17 horses and their jockeys take to the course. 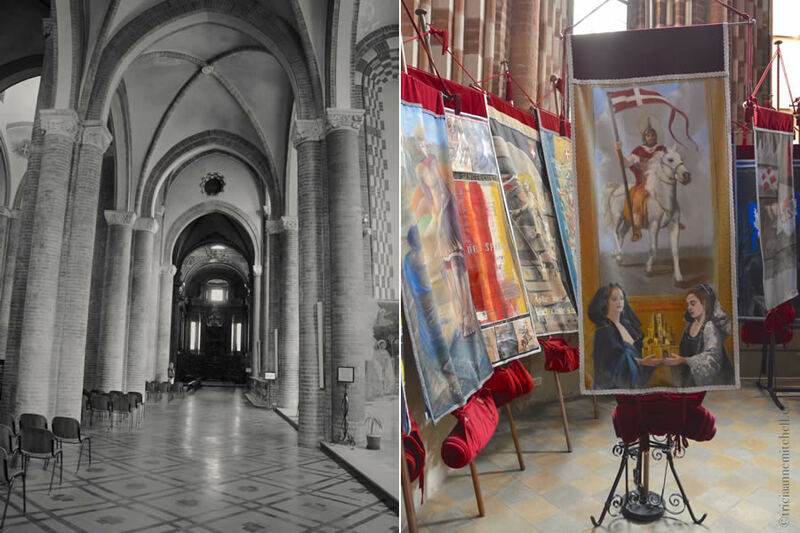 Stepping into Asti’s San Secondo Church, the Palio theme continued as we were greeted by the church’s collections of contemporary as well as antique faded Palio flags. 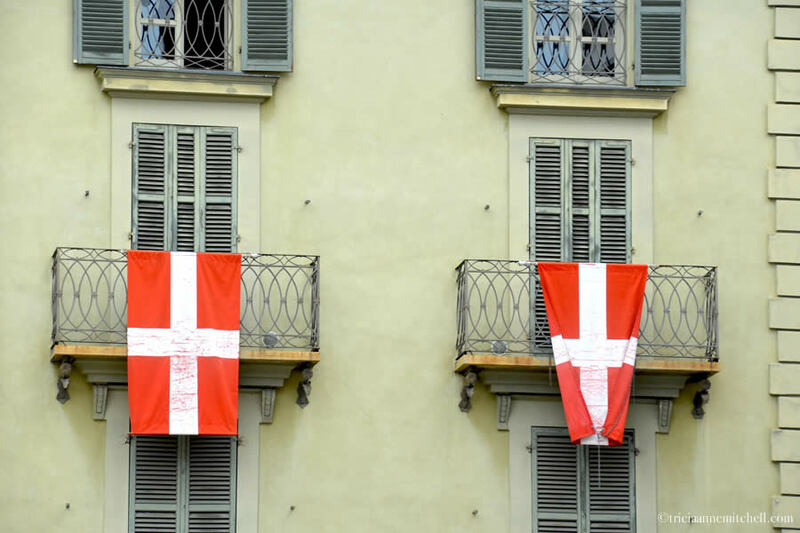 “Asti’s City Hall commissions painters to create a set of flags to represent each district participating in the Palio, one flag is large, the other smaller. The winner of the race is given the large version of the flag as a prize, while the church gets to keep the smaller one,” Marco said. “Unlike the Palio in Siena, Asti is more generous, giving second and third-place participants prizes too. Traditionally, the last-place participant even gets an anchovy and some lettuce,” he added, with a smile. Walking past the church’s weathered frescoes, and ornate paintings comprised of numerous panels, Marco switched gears to talk about Asti’s art history, relaying that while Piedmont didn’t have a Renaissance as Florence, Venice and Rome did, its art nevertheless represented a variety of styles from elsewhere in Europe. With Italy’s August holiday season in full swing, Marco mentioned that he’d had to be flexible when choosing which gastronomical spots to take us to. 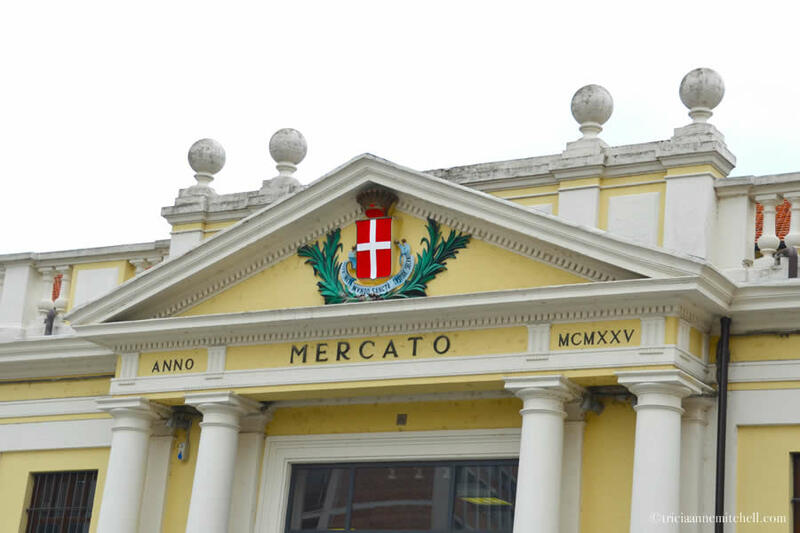 Because so many Italians had taken to Adriatic beaches, or were vacationing elsewhere in Europe, we spotted a plethora of shuttered storefronts and stalls at Asti’s markets. This made encounters with the smiling, welcoming staff ‘left behind’ even more appreciated. 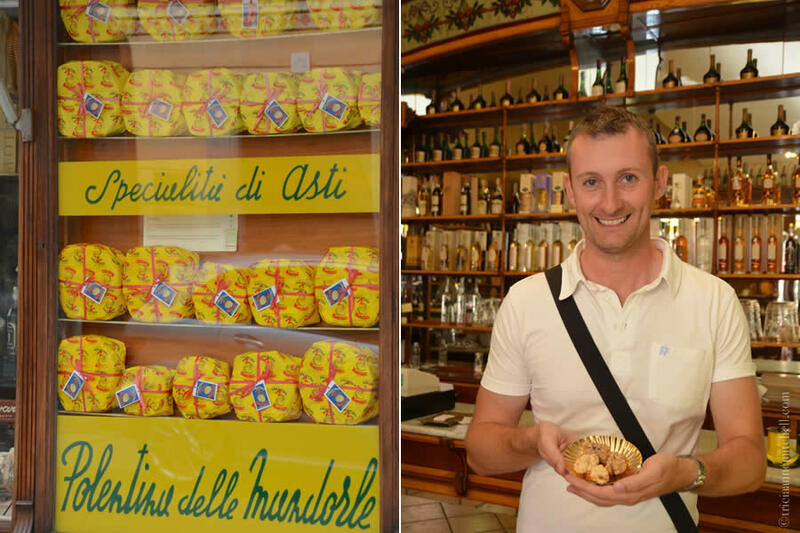 While in Asti, we’d visit vibrant markets and a pastry shop, before sitting down to a lunch that married Piemonte culinary tradition with more non-traditional ingredients like ginger, coconut, and pineapple. 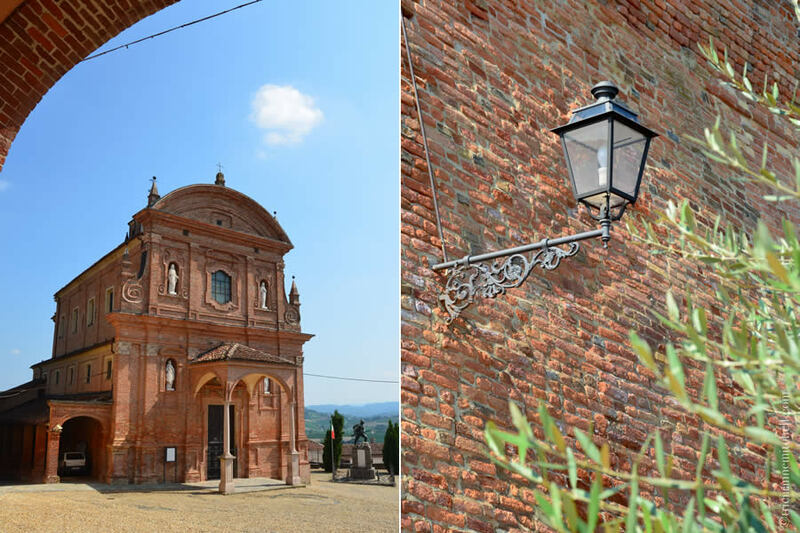 And, once out in the Monferrato countryside, we’d complete our encounter with Monferrato’s most famous products while sampling wine from a family-owned winery, and shadowing with a truffle hunter. 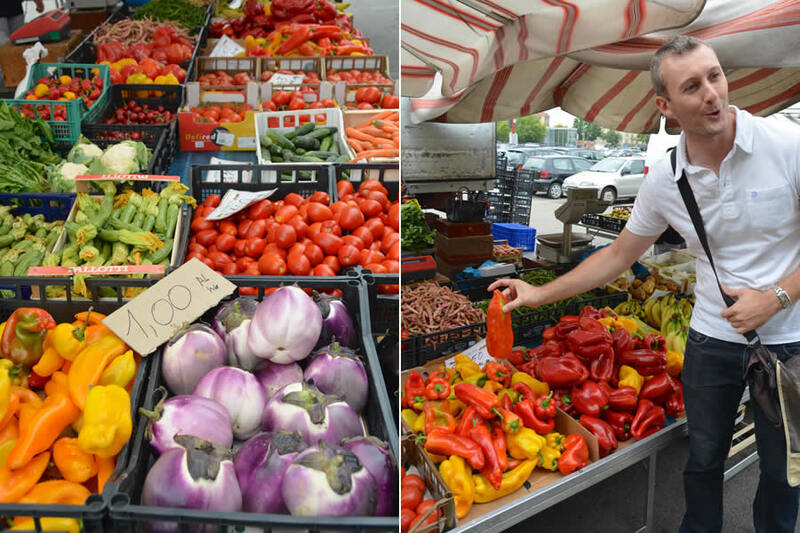 Our first stop in Asti was an outdoor marketplace where mammoth peppers, colorful eggplant, and zucchini flowers caught my eye. Marco (right) mentioned that we’d arrived in Piemonte a bit too early to meet Nizza Monferrato’s Hunchback Cardoon, a vegetable related to celery and artichokes. Nicknamed the ‘hunchback’ because of its characteristic shape, the cardoon flesh is white and tender, and can be enjoyed raw or with anchovy sauce. 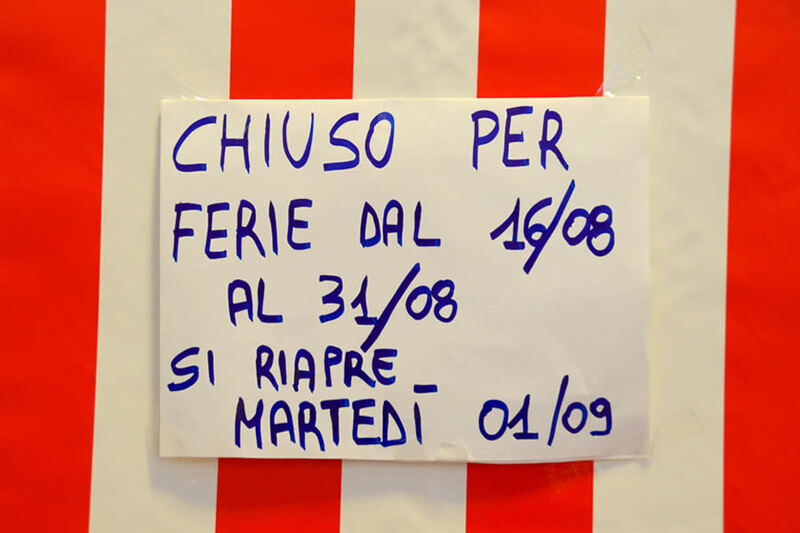 A common sight in Italy during the month of August: signs announcing closures of businesses for much or all of the month. This was one of many closures inside Asti’s fresh marketplace. 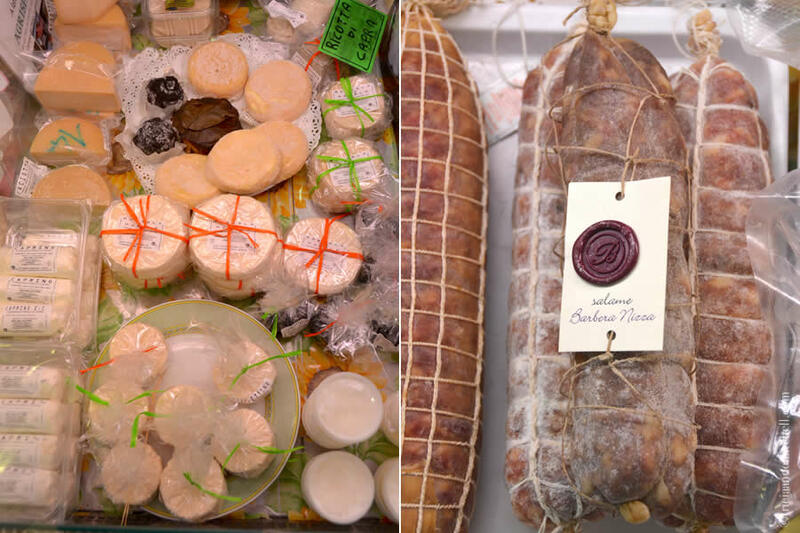 Cheese, glorious cheese (left) and artisan salami (right). This salami was even made with Barbera wine, one of Piemonte’s most-celebrated types. Note the monogrammed wax seal. 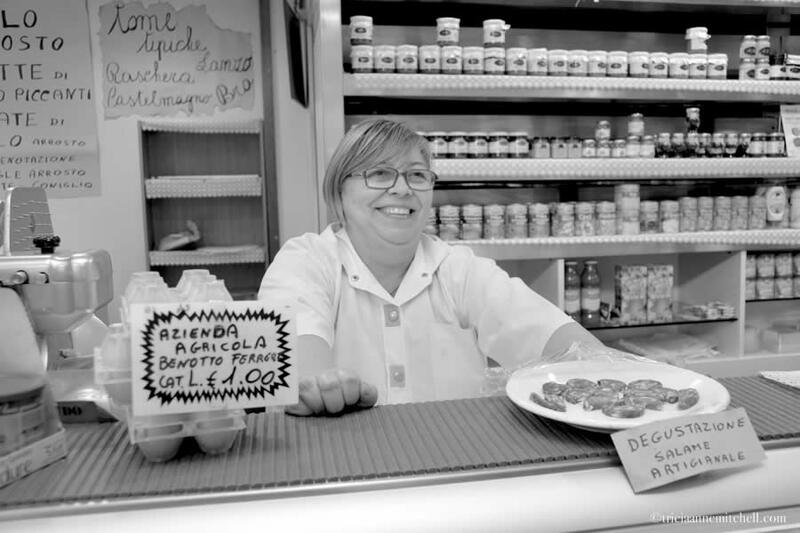 Gregarious Rita and her daughter, Sonja, invited me to hop behind the counter at their meat & cheese stall. We sampled a memorable Cacioricotta cheese there, which is made with goat milk, and ideal for salads since it’s a firmer cheese than its Ricotta Romana cousin. 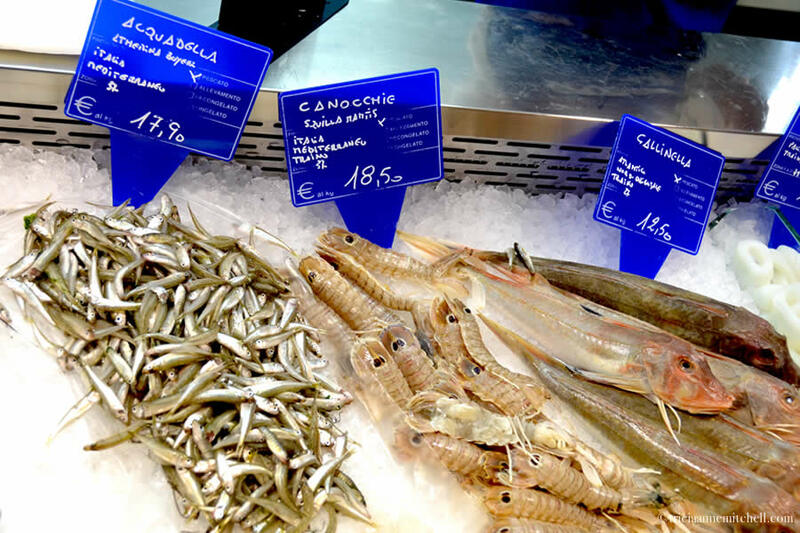 Anchovies have traditionally favored heavily in Piemonte’s cuisine, because it was previously the only fish they could get given the area’s distance from the sea. Merchants used to fill small barrels with salt and anchovies, and would then travel through inland areas to sell them. Today, most of Asti’s fish comes daily from the coast, and some of it is frozen. By law, merchants must display a fish’s origin. Asti’s flag. Asti was very powerful during the Middle Ages, thanks to its banking institutions and prominent Alfieri and Roero families. Asti even had its own currency. 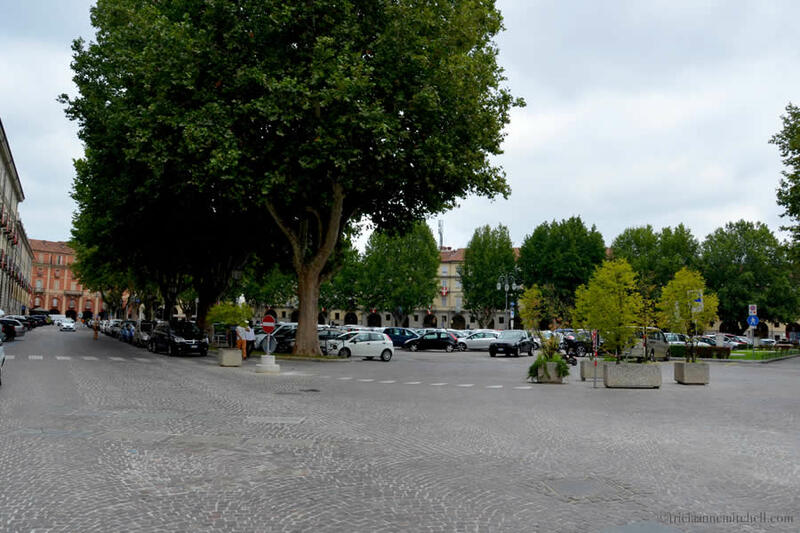 It might be hard imagining this parking lot and road as the setting for an elaborate parade and horse race, but each September this spot is dramatically transformed for Asti’s Palio. As Marco explained, thick layers of sand are delivered, seating is installed, and about 1,000 people dressed in elaborate costumes pass by in a parade. It’s believed that Asti’s Palio is even older than the one held in Siena, Italy, with records showing that it’s been held in Asti for more than 700 years. Asti’s Piazza San Secondo. 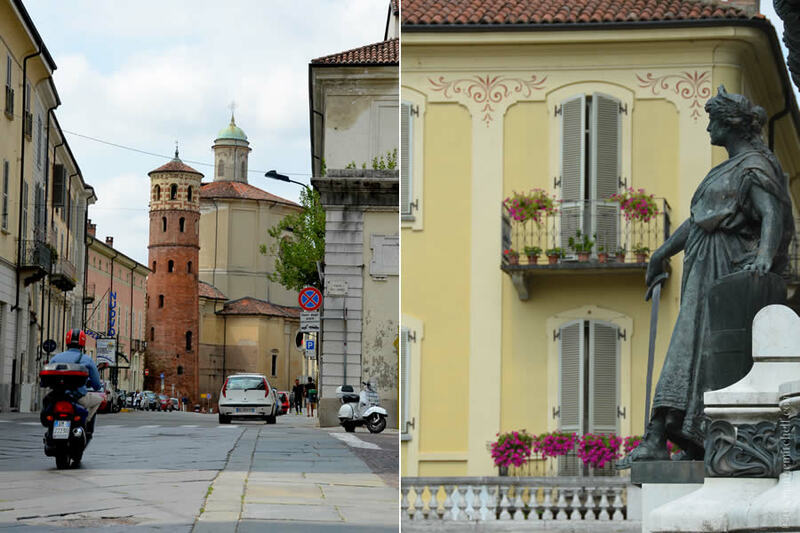 On the left, the city’s Town Hall, and on the right, the San Secondo Church. Marco playfully referred to such piazzas or town squares, as the ‘living room of a city.’ I also loved his analogy for describing how European churches were built on top of existing religious structures, over the centuries. “In layers, a bit like lasagna,” he said. Inside the San Secondo Church. On the right, a collection of Palio drappi, or flags. Every year, Asti’s City Hall pays artists to create a pair of different-sized flags to represent each participant in the horse race. The Palio’s winner is eventually presented with the larger flag as a prize, while this church is given a smaller version. While the flags shown here are newer, the church has some on display that date back to the 1800s. The artists can paint in a new or traditional style, however, they must incorporate certain elements into the flag, such as Asti’s flag, San Secondo on a horse, etc. 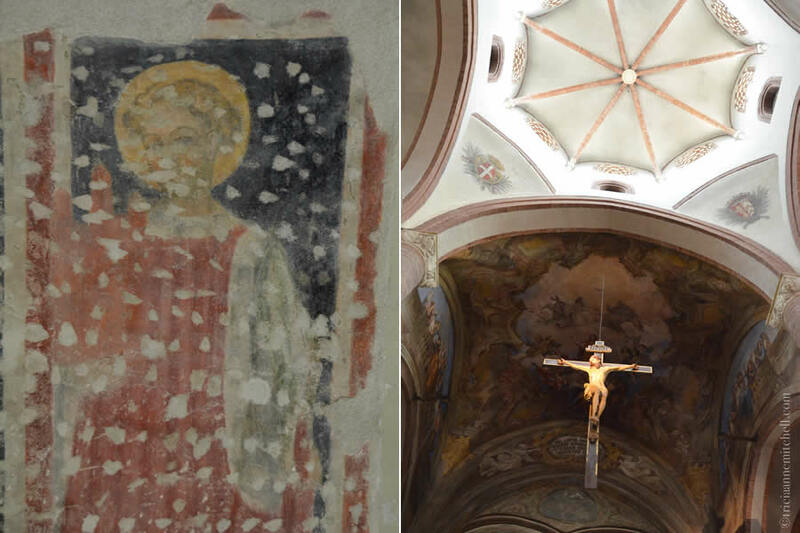 The church’s frescoed paintings (left) date back to the 1300s. The scratch marks visible here are the result of later generations of artists scratching the stucco below so that new artwork could adhere better. Fresco artists actually painted in freshly-laid, wet plaster, allowing the painting to become a part of a wall once the plaster had dried. 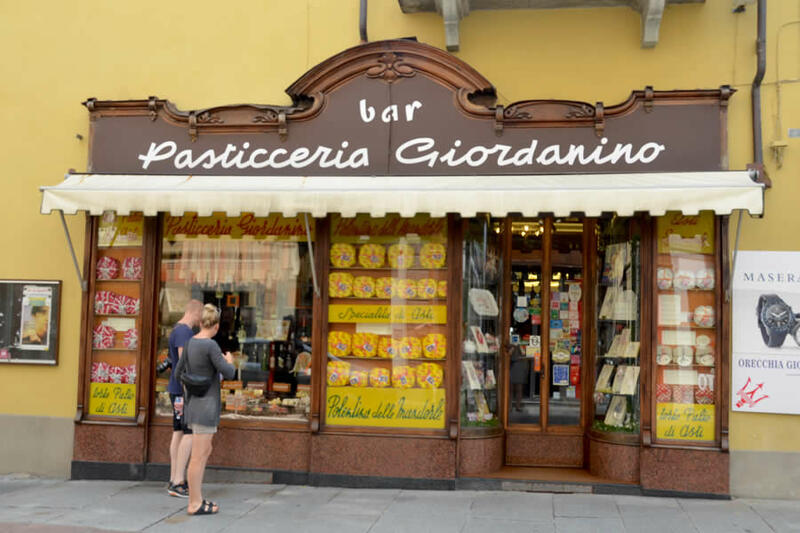 With all the holiday closures, Marco was unable to take us to a lot of Meet Piemonte’s regular stops, including a pastry shop that’s owned and operated by women. 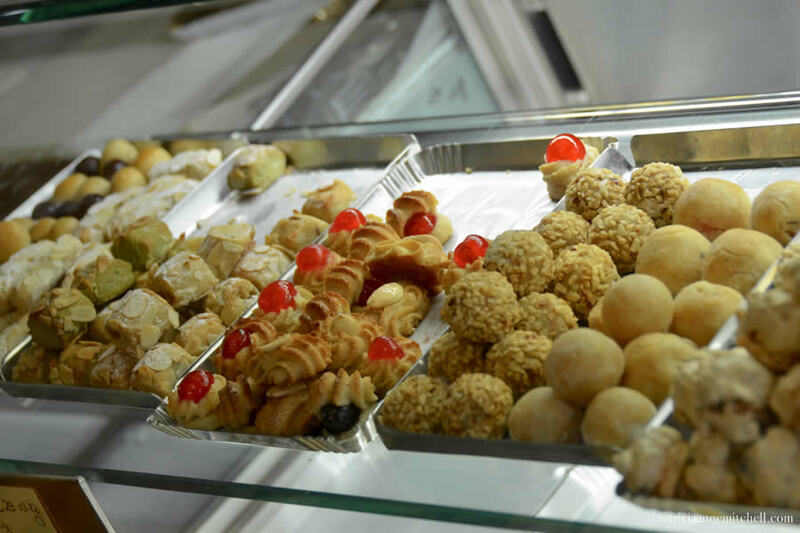 We instead stopped in to the Pasticceria Giordanino. I couldn’t enjoy the Polentia featured in the window on the left because it has gluten. Marco said that the treat looks like polenta, but is made with almonds and cornflour, Maraschino liqueur and cherries. We instead sampled two other biscuits, one comically named Brutti ma Buoni (ugly but good); and an Egyptian Merengue. Both had hazelnuts, a nut that’s common in Piemonte dishes and desserts. This pastry shop also makes chocolates, but refrains from doing so when the weather is sizzling in the midst of summer. 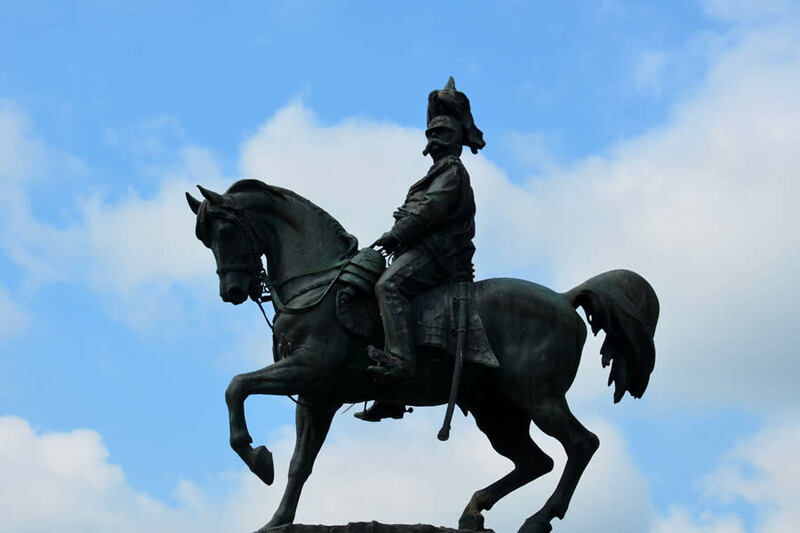 A statue dedicated to Umberto I, an Italian king. Asti’s main cathedral is not located in the modern city center, showing how the town’s nucleus actually migrated over the course of the past centuries. It’s the largest Gothic cathedral in Piemonte. Marco explained that Piemonte Gothic is more simple than Notre Dame in Paris or Milano’s Duomo. “There’s less stained glass, and more frescoed walls to tell stories to the congregation who couldn’t read back then,” he said. Asti once had more than 70 towers, like this one on the left. Unlike walls, the towers were not for protection, rather they symbolized power and wealth. Today, many of Asti’s towers have been adapted, sometimes incorporated into newer structures. Taking a break between our foodie and art history tour, we stopped to eat lunch at Osteria Il Podestà, in Asti’s Old Town center. 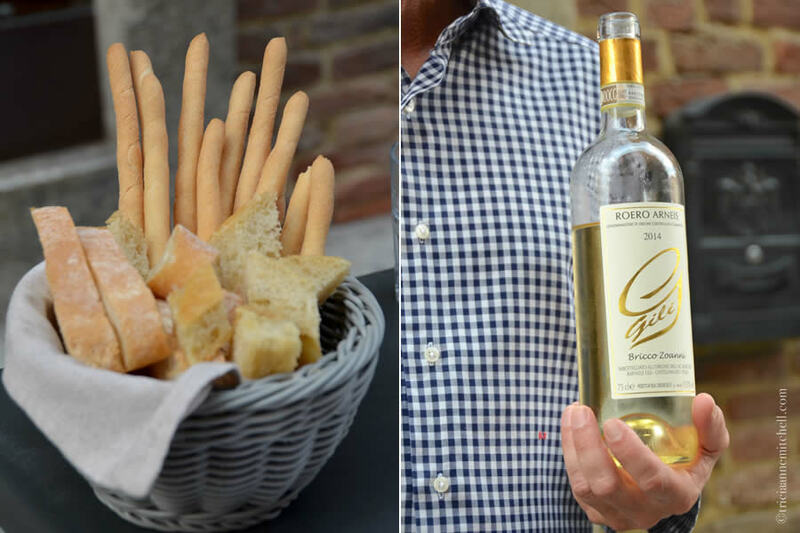 These thin, crunchy breadsticks or Grissini (left), are a Piemonte invention. According to legend, in the 17th century, a child of the powerful Savoy family was ill and unable to digest standard bread. His family doctor asked a baker to design such a recipe, and Grissini were born. That royal child eventually become the King of Piemonte, Sicily, and Sardinia. On the right, a bottle of Roero Arneis wine. (Arneis is the name of the grape.) While I enjoyed a glass of Arneis, Shawn had a glass of Dolcetto d’Alba, a red wine from the region. Agnolotti del Plìn are a special pasta dish from Piemonte. In Italian, plìn means ‘pinch’, referring to how this pasta is hand-pinched, ensuring the filling is sealed inside. Marco’s stunning yellow dish was dressed with butter and sage, unfortunately not gluten free, so I could only ‘taste with my eyes’. My dish: cuttlefish in julienned strips, served with a marinated ginger and pea cream sauce. 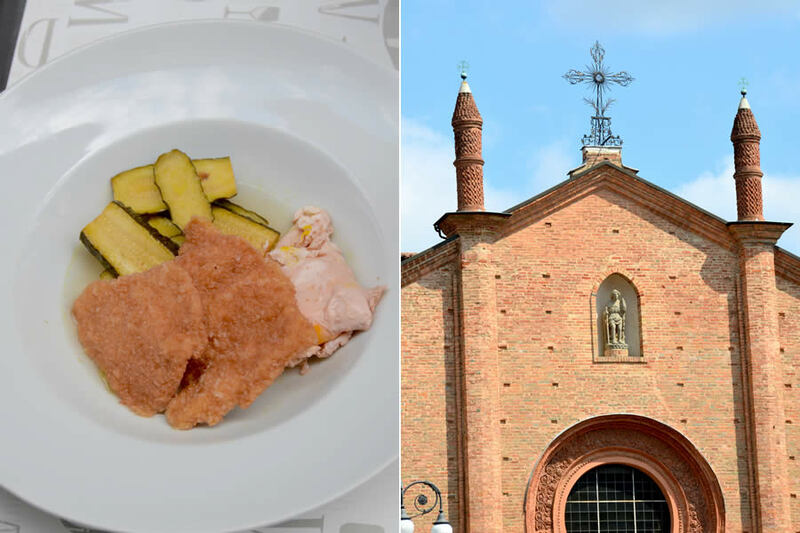 On the left, Shawn’s traditional Piedmontese dish: soused (or pickled) breaded chicken breast, zucchini, and egg. As Marco explained, dishes were regularly preserved in such a fashion before refrigerators were invented. On the right, the San Secondo Church, which we visited earlier in the morning, became increasingly bathed in sunlight as we enjoyed our lunch. Marco thoughtfully switched places so I could have a restaurant seat with this view. Dessert time! We shared these two scrumptious desserts. Left: Semifreddo, a semi-frozen dessert that’s made with whipped cream and pasteurized eggs. After being chilled, the custard-like concoction is dusted with powdered sugar, and a frozen coconut and pineapple sauce. As the dish melts in your mouth, new delicate flavors emerge. 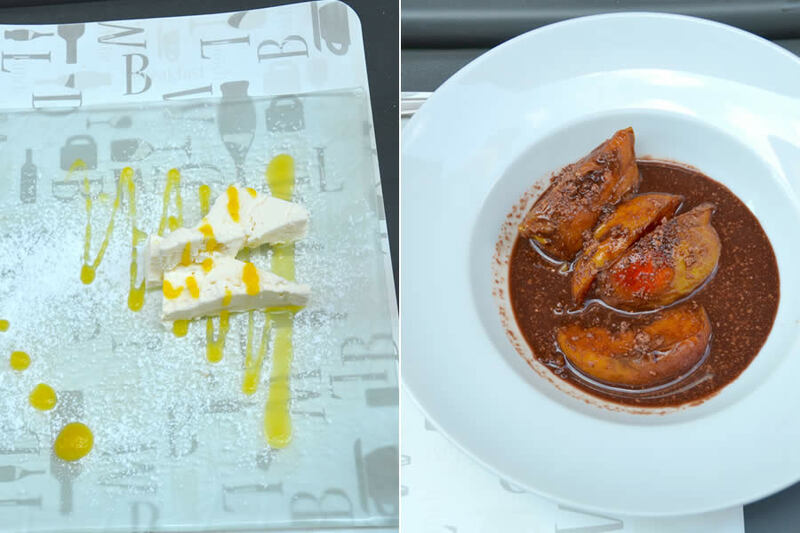 Right: Pesche Ripiene Al Forno, or oven-baked peaches swimming in a sauce of chocolate, peach juice, crumbled Amaretto cookies, and egg. Unlike many American desserts, these dishes were not overly sweet. 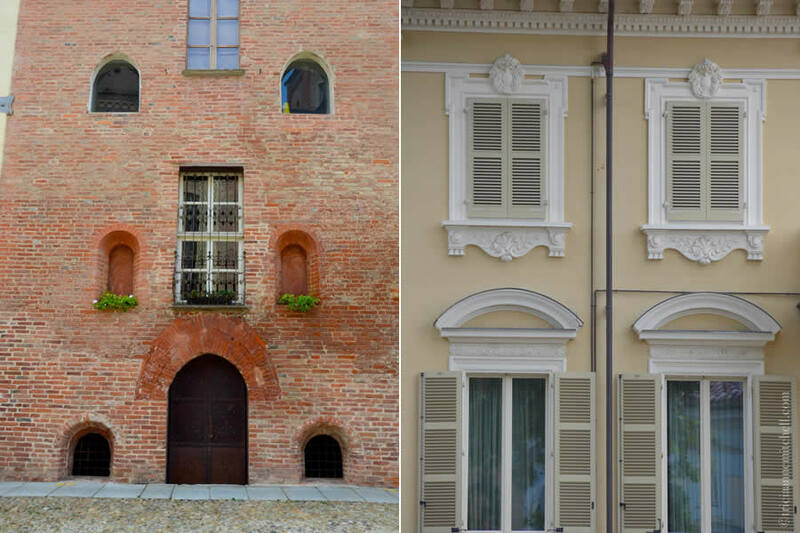 While the cities of Alba, Asti, and Barolo are popular draws for European tourists and gourmet foodies from the United States, villages, such as Castelnuovo Calcea, are quiet and lesser-known Piemonte destinations. On the way to our wine-tasting, Marco drove us out of urban Asti, into the Monferrato countryside. 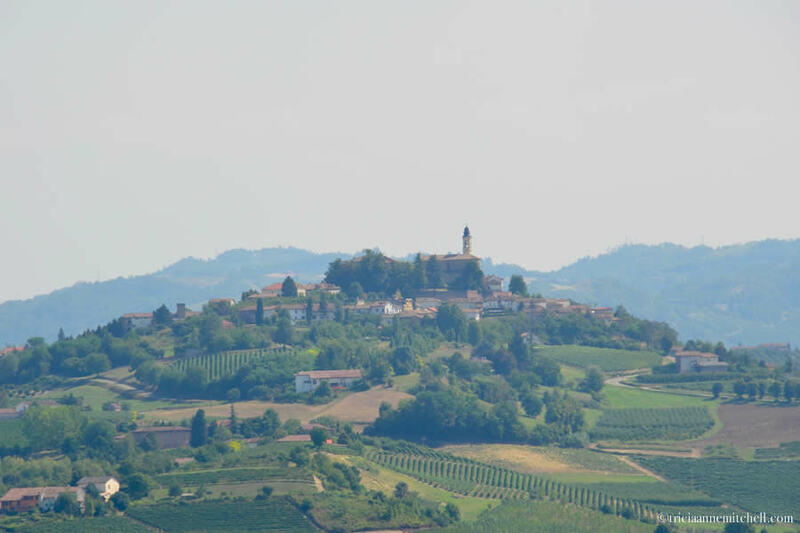 My spirit for Piemonte was officially awakened when I saw the patchwork quilt-like landscape before us: striped vineyard patches, bumped up against solid fields of green, nestled beside clusters of burnt-orange rooftops. Marco aptly relayed that locals refer to it as an intricate “lace-like” panorama. 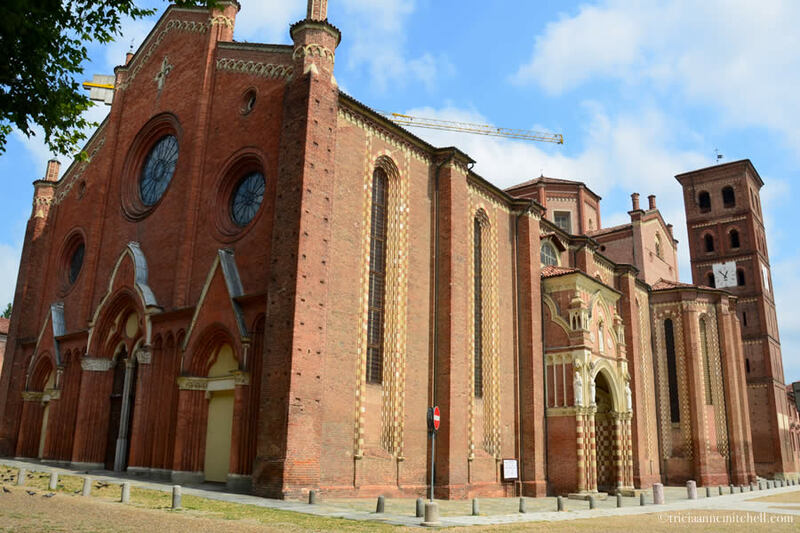 Promising a beautiful view of the surrounding hillsides, Marco stopped in Castelnuovo Calcea, where we admired the red-brick buildings, a centuries-old church, and extraordinary views, framed by the arched window of a historic tower. 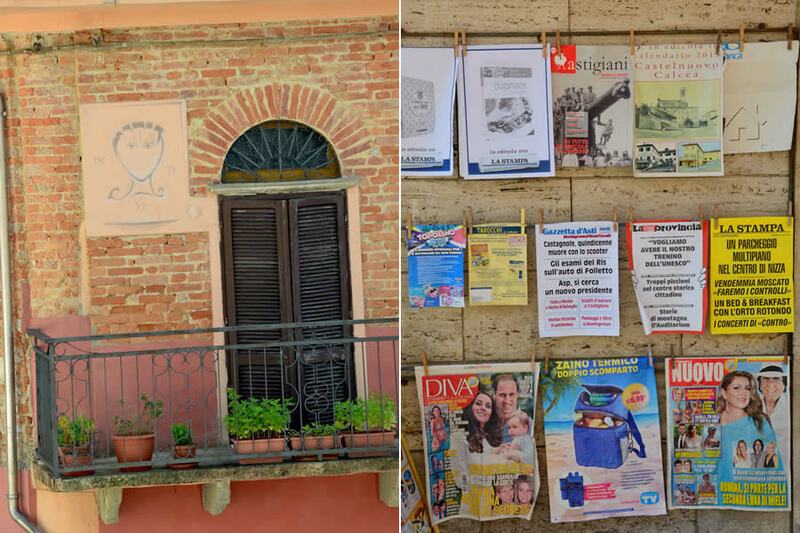 A vocal dog and pinned front pages of newspapers for sale hinted at civilization in Castelnuovo Calcea, otherwise it felt like an elegant ghost town. Perhaps the siesta hour coupled with sizzling temperatures had something to with that. 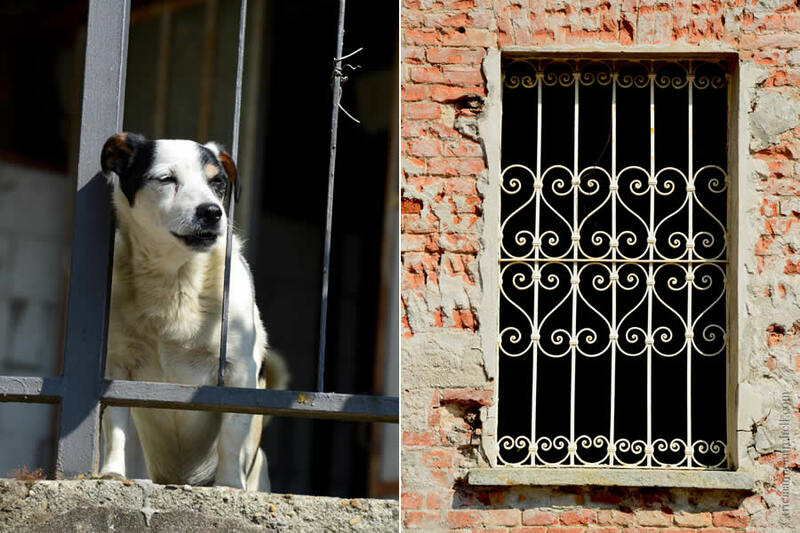 It was siesta time during our visit, perhaps explaining why we didn’t see any living beings in Castelnuovo Calcea, except for this gregarious canine (left). 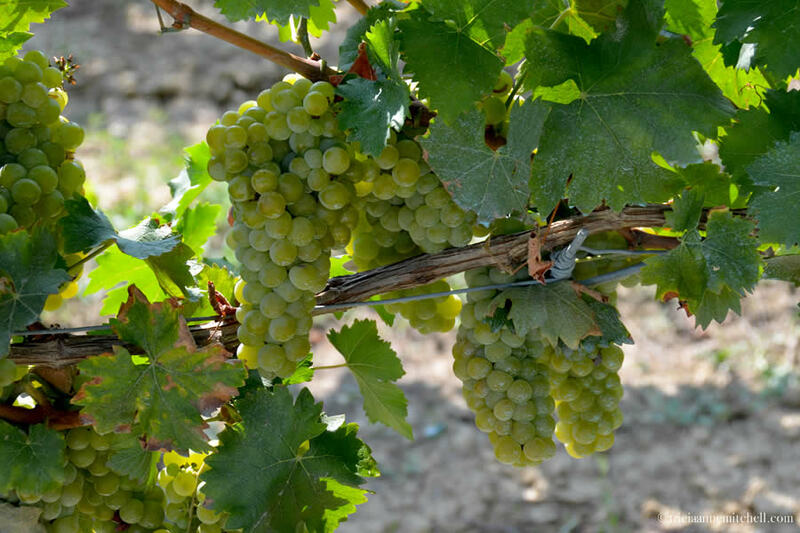 Tempting grapes just about ready to harvest in the Monferrato hills. 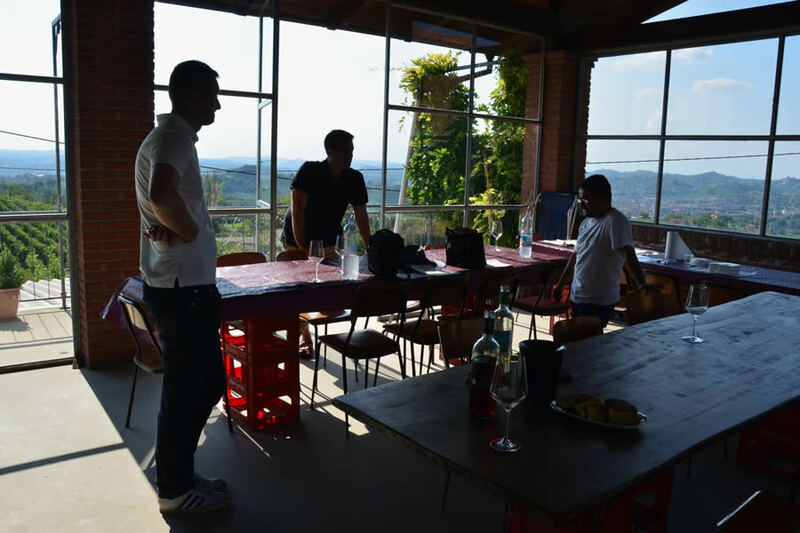 Riding on curvy, roller coaster-like roads among Monferrato’s rolling hills, Marco piloted us to the unassuming Erede di Chiappone Armando Winery. Marco had explained earlier that he and his three Meet Piemonte colleagues prefer to work with smaller, family-owned operations. Their business name reflects their desire to introduce visitors to the locals. Our first wine-tasting destination seemed well-aligned with that philosophy. The vineyard was bustling with activity. Family members were coordinating a house-painting project and tending to the vines. Our host, Daniele, greeted us in the courtyard, along with a skittish kitten. We immediately set off to explore the fermentation room and cellar, appreciating the fact that Daniele’s grandfather crafted the cellar himself. On the ceiling, high above the French oak barrels was stylistic plasterwork depicting four wine bottles. You could sense the layers of history inside: shelves filled with empty collectible wine bottles, and a more modern fluorescent light illuminating the chalk markings on the barrels below. Pointing to a square cut-out in the floor, he explained that the grapes are pushed through this trapdoor, into a tube, and from there they are transported to a machine and pressed. “This approach allows for more freshness, and ensures a good start to the fermentation process,” Daniele continued. In the winery’s panoramic tasting room, which was flooded in sunlight, we tried a white wine, and a Rosé. 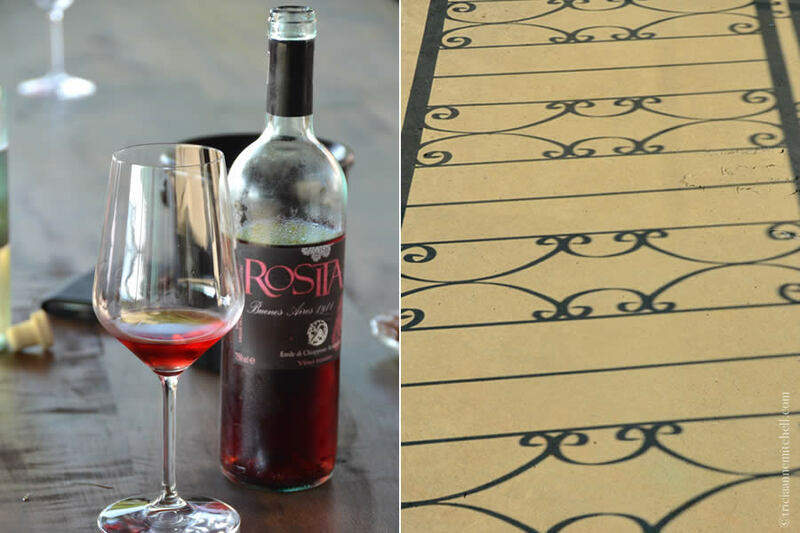 The blush-colored 2014 Rosato, made from Barbera and Dolcetto grapes was our favorite. It was fruity and nicely-chilled, bringing to mind flavorful summer peaches. Though the day had transitioned from largely grey skies in Asti, to intense sunlight in Monferrato’s countryside, a few wispy clouds still dotted the sky. If not for them, Daniele and Marco explained, we might have been able to spot the Alps, perhaps even the Matterhorn, from Daniele’s tasting room. 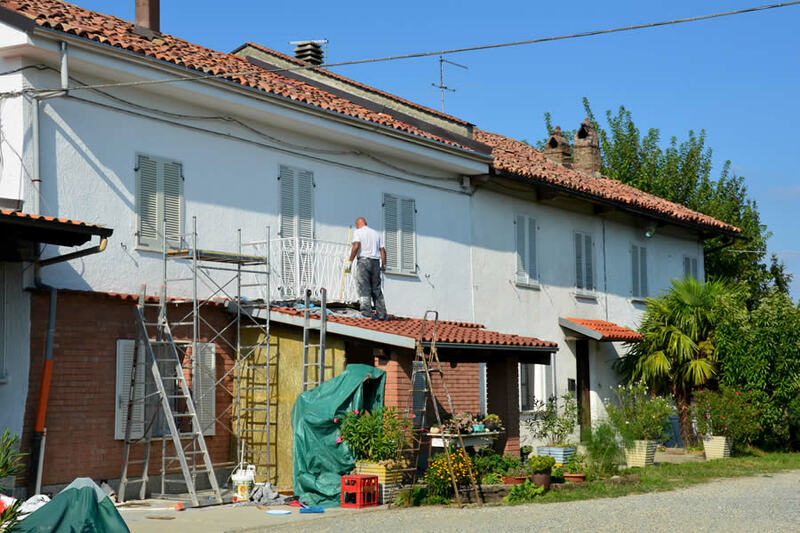 The family-owned Erede di Chiappone Armando Winery gets dressed with a fresh coat of paint. Sixty-five percent of Erede di Chiappone Armando Winery’s vines are more than 50 years-old. The family produces about 40,000 bottles per year. 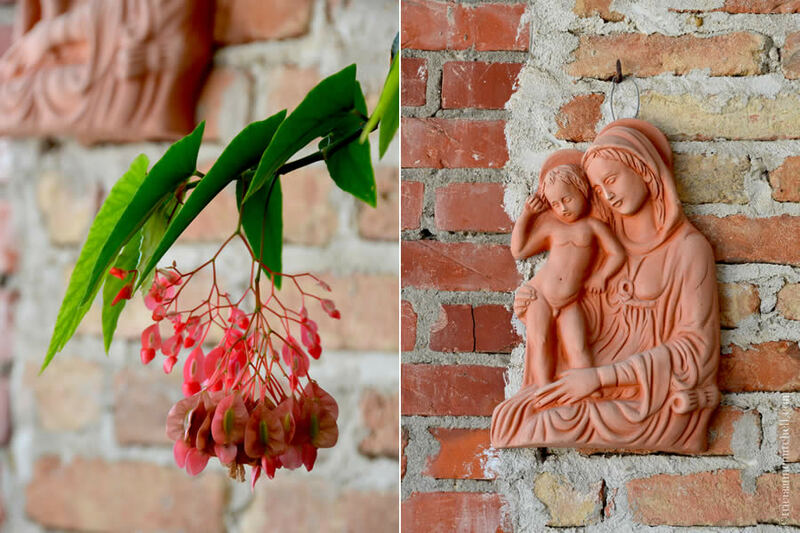 Details of the winery’s relaxed courtyard. 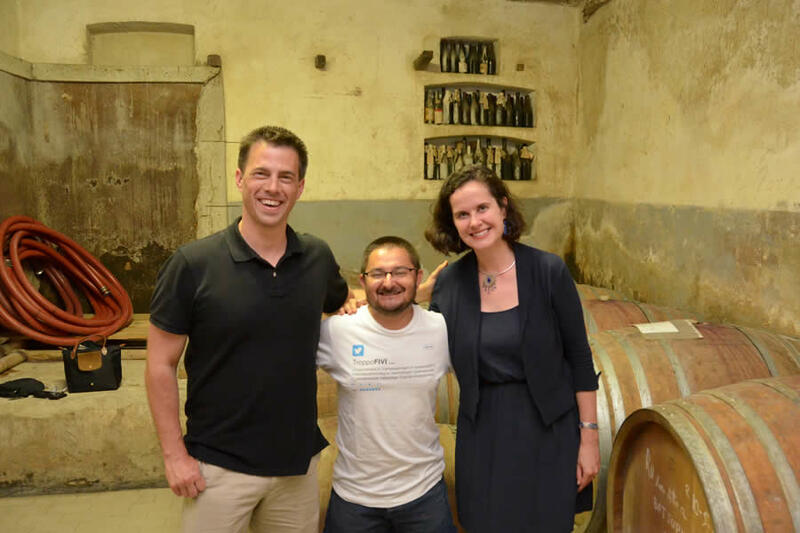 Marco, Shawn, and winemaker Daniele Chiappone in the winery’s panoramic tasting room. Shadows (right) and a bottle of wine named after Daniele’s grandmother, Rosita (left). This 2014 Rosé was made with a blend of Barbera and Dolcetto grapes. We also sampled a white wine made from Nascetta and Chardonnay grapes. This tiny chapel sits next door to the winery. The grape harvest is done by hand, as the vineyard is too steep and narrow for machines. 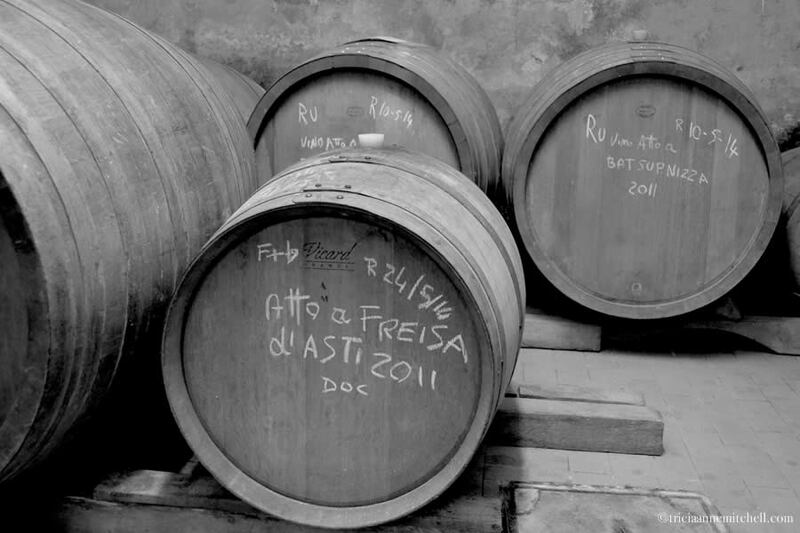 French oak barrels are used to age the wine. Sharing a laugh with Daniele, in the cellar built by his grandfather. For years, I’d wanted to witness a truffle hunt, but we never seemed to be in the right place during the right season. Just as our wine-tasting with Daniele was wrapping up, Marco ended a call on his mobile phone, and grinned. On the way to the truffle hunter’s home, past tractors and people harvesting hazelnuts and putting them into overflowing sacks, Marco gave us an overview of truffles. While it is prized internationally, Marco explained, the white truffle is very selective about where in the world it crops up. Most of these fantastic fungi are only found in the countryside around the Monferrato and Langhe area, while a smaller number are harvested in Tuscany, France, Slovenia, and Croatia. White truffles, it turns out, are more delicate than their black truffle cousins. Whereas the black truffles can be cooked, even added to sauces or oil, the white ones should only be cleaned and brushed. The white truffles are best enjoyed on simple dishes such as pasta, with sage and butter. Since the white truffles are delicate and spoil quickly, there is a rush to get them from their origin to their destination quickly. This need for careful and quick transport, coupled with their reputedly-fabulous flavor, makes the white truffles very pricy. Italy’s white truffles are perhaps the most esteemed, fetching between 250 to 500 Euros per 100 grams (roughly $277-$555 for 3.5 ounces)! Arriving at Tartufaia , an agriturismo (tartufaia also means a place where truffles are found), we were met by 77 year-old Egidio, who was clad in teal overalls, and a blue and white plaid shirt. Marco thanked Egidio for offering to walk us around his grounds on such short notice. With Marco acting as translator, Egidio said there was no reason to thank him. “This is a passion for me. I’m happy to share something I love with others,” he said. 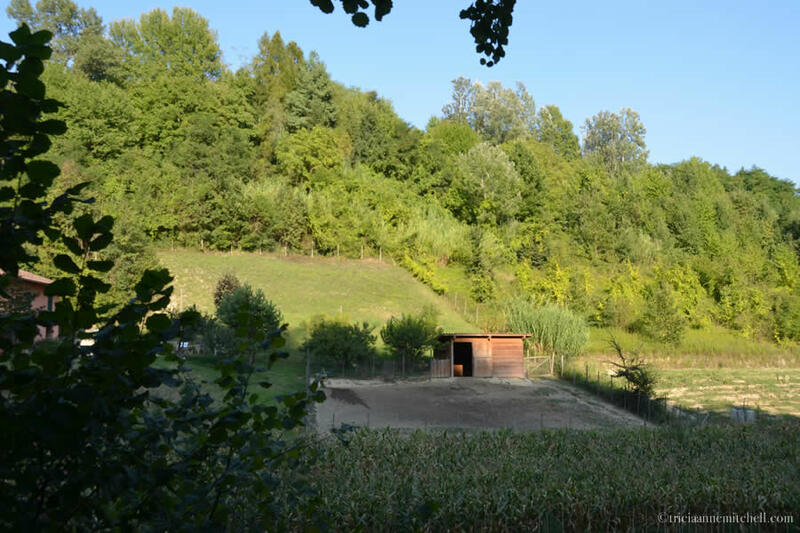 Truffle hunting, it seems, is in Egidio’s genes, with family members on his paternal and maternal sides having made a living out of truffle hunting for generations. Soon we were introduced to Egidio’s two trusty truffle-hunting canines. One was “retired”, soaking up the late-afternoon sunshine, while the other pooch was utterly ecstatic when taken off her leash. We learned that the younger, sprite dog’s name was Brill, related to the Italian word for ‘brilliant’. Brill danced around her owner’s ankles, occasionally coming over to sniff our hands, or dash around the grounds. “Without a dog, it’s not possible to find the white truffles. We don’t use pigs for hunting here, as they do in France. The pig would ruin the truffles, because the white truffles are much too delicate for them,” Egidio said. Entering the neighboring forest, Egidio and Brill seemed like they’d suddenly transitioned to business mode. Both Egidio and Marco reiterated that it was too early in the season to be finding white truffles, and that ours was more of a mock hunt. Still, we became hopeful and excited when Brill began to sniff a patch of ground, looking to her master for instructions. The dog then began digging excitedly, tearing up the same color soil that she’d left on my navy dress when she earlier jumped on me to say hello. “Come on, find something!” said Marco, cheering Brill on. Not surprisingly, given the time of year, Brill did not find any white truffles. Still, she was enthusiastic, and her enthusiasm was contagious. Marco relayed that Brill was excited to have visitors at the property, because she associated visitors with truffles, and ultimately dog treats, which are her payment. In advance of tourist visits, it turns out, Egidio will often find a truffle specimen, and hide it on the property so Brill can demonstrate what it’s like to unearth one. Since Brill is given dog treats whenever she uncovers a truffle, she is accustomed to regularly finding truffles when observers are there. She seemed a bit surprised that she did not recover any of the prized fungus during our visit. “A tartufaia (piece of land) that produces truffles can be more profitable than a vineyard. 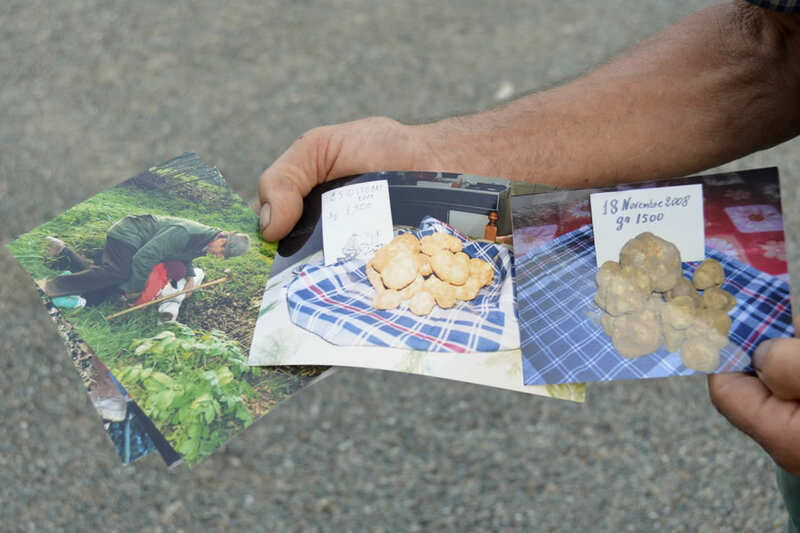 It’s like winning a lotto if you find a plot of land that’s productive,” Egidio explained, as we walked through the muddy landscape, one that the family tinkers with to make it more conducive for white truffle growth. Egidio is one of those lucky 200, estimating that he finds about 5 kg (11 pounds) of truffles each year. 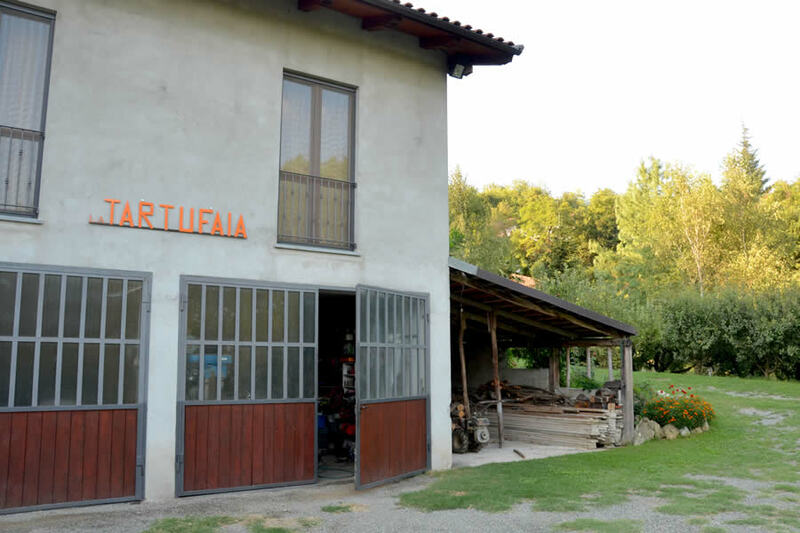 ‘Tartufaia’ is the name of a generic place where one finds truffles, and is also the name of the family’s agriturismo business. 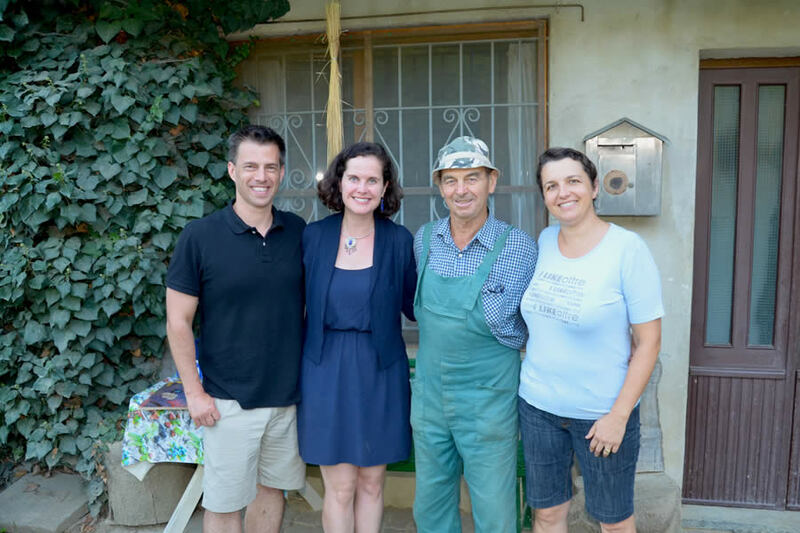 At the agriturismo, we meet Egidio and his family. Egidio descends from a long line of truffle hunters on both his mother’s and father’s sides of the family. On the right is a painting of his grandfather. In addition to truffle hunting, Egidio’s family grows apples, sunflowers, blueberries, raspberries, pears, licorice, artichokes and corn. This type of corn (left) will be used to make polenta. Egidio mentioned that it’s a sweeter type of corn, and a variety that is disappearing. Freshly-harvested hazelnuts on the family’s property. Egidio’s specially-trained truffle hunting dog is named Brill, a play off the Italian word for brilliant. 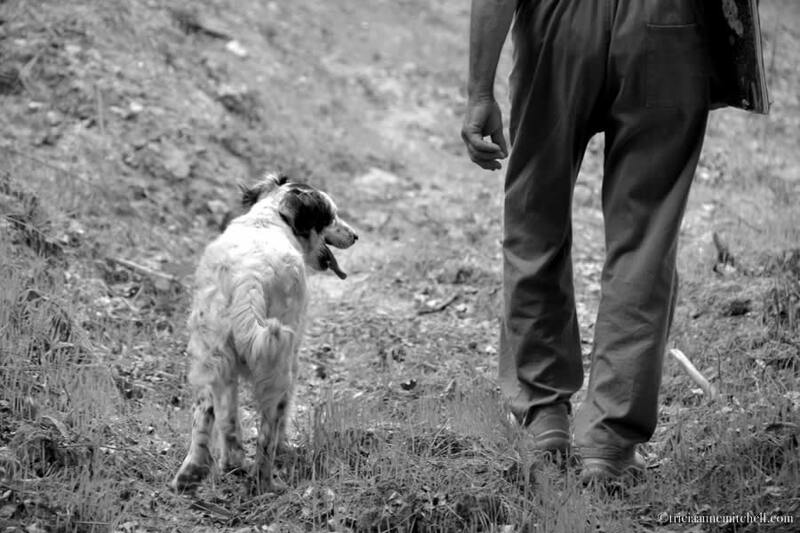 “Without a dog, it’s not possible to find the white truffles,” he explained. “The black truffles I can spot on my own — because of my good eyes.” During our visit, it’s too early in the season to find the most valuable white truffles, but the less pricy black truffles are generally more widely available. Egidio and Brill scan the carefully-tended landscape for truffles. White truffles cannot be cultivated and can sell for 500 Euros per 100 grams when supply is low, or about 250 Euros per 100 grams when supply is higher. Rain is needed to generate the new spores, and if Egidio finds a white truffle, he tosses a portion of the find back into the ground with the hope that it will act as a spore and repopulate. Egidio maintains meticulous records of his truffle finds in a book (left), making note of the temperature during the find, the type of tree near which it was located, the price at which the truffle later sold, etc. On the right, evidence that Piemonte’s landscape was submerged underwater millions of years ago. Egidio said he and his family had recently terraced their land to make it more humid and conducive to truffle growing, and this unearthed lots of shells. Truffles apparently thrive in this shell and calcium-rich soil. Pausing with Egidio the truffle hunter, and his daughter, Laura. Asti is located in Italy’s Piedmont (Piemonte) region, about 55 km (30 miles) southeast of Turin, and 140 km (85 miles) southwest of Milan. High-speed trains link the Piedmont area to Italian tourist meccas such as Rome and Venice. See Trenitalia for schedules and prices. 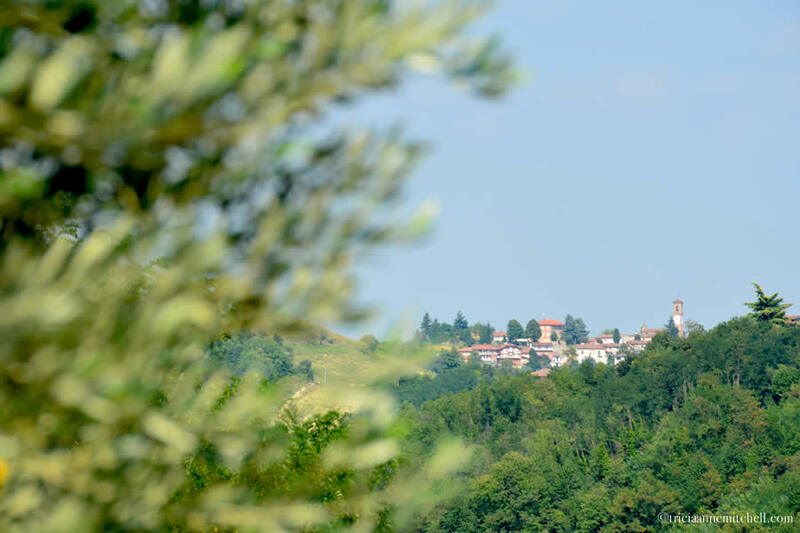 While we found mass transit accessibility to be good in larger cities like Asti and Turin, we were told that public transportation is quite limited in Piemonte’s countryside. Locals routinely advised us to rent a car or hire a private driver. Marco, one of Meet Piemonte‘s co-founders, coordinated the details of our visit in advance, and guided us through each excursion. 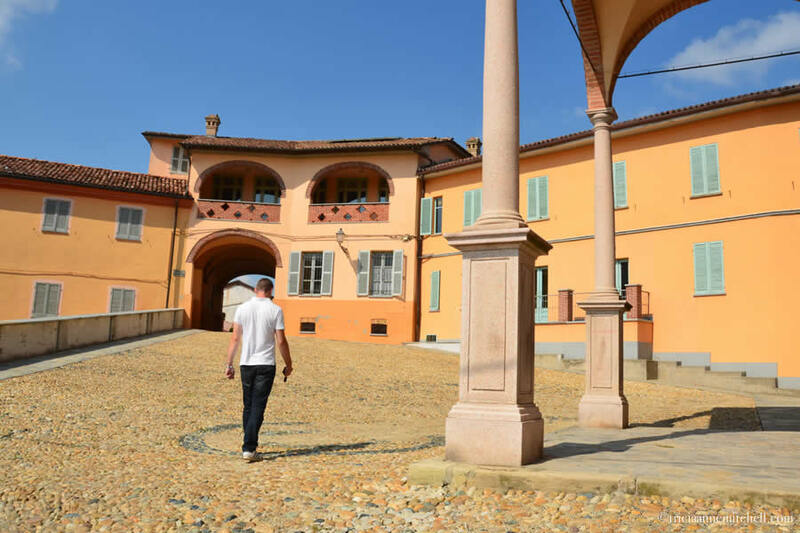 He and his colleagues lead customized tours covering everything from wine tastings, to cooking classes, truffle hunts, hiking and biking excursions, and visits to Piedmont’s rice fields. Having worked in the tourism industry for more than a decade, Marco speaks fluent English and also helped ensure that tour partners took into account my gluten intolerance. For more information, visit the Asti Province Tourism website. We’d like to say Mille grazie to Marco for being such a knowledgeable, patient and enthusiastic host — and trip coordinator! Tricia dear girl you had me swooning with delight. The photographs – oh the photographs were nothing short of fabulous. I found myself slipping into them – smelling the countryside. Enjoying the wine. Patting the sweet dog and tasting the glorious food. 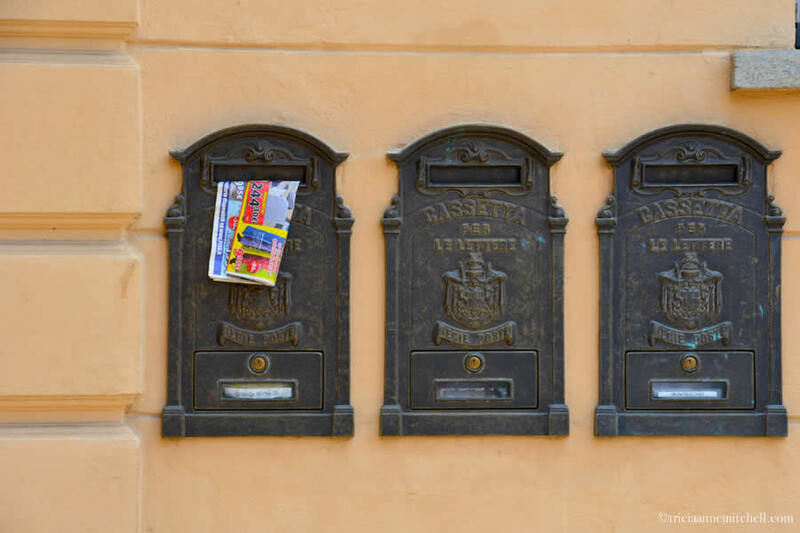 You have captured the smallest detail (the advertising flyer hanging out of a mail box) so beautifully. What a wonderful way to spend my Monday morning. Sipping coffee and reading about Piedmont. Ciao, dear Virginia! 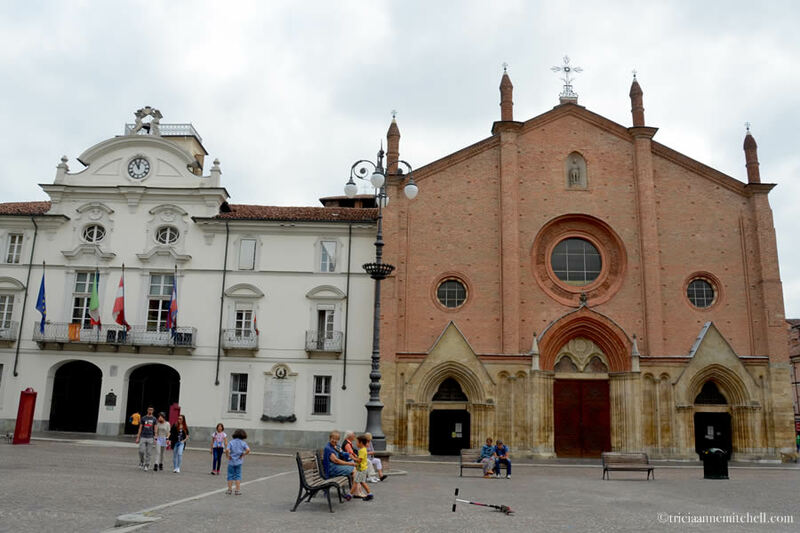 :) I’m delighted to hear that this post allowed you to have an armchair adventure in picturesque Piemonte. We too loved enthusiastic Brill, and were intrigued to learn that with the correct training, almost any canine could be a truffle hunter. Admittedly, I’ve never tried the prized white truffle, but it’s on my must-savor list. As a foodie and accomplished restaurateur, I’m curious if you have, and if you could describe it? Thank you for your kind comment; it makes me happy to know you enjoyed the post! When I was living in Amsterdam I did taste it. Definitely an acquired taste at first but then you start dreaming about it. You know .. being able to say … “oh I have this truffle farmer in my pocket”. During our time in Italy, we’ve met a few locals who were lucky enough to have truffle farmers, traditional balsamic vinegar and Parmigiano-Reggiano producers among their circle of friends. Of course this meant that they regularly incorporated those tasty treats into their meals. Oh so many favorites among these gorgeous images! Pamela, grazie for your kind words about the images. 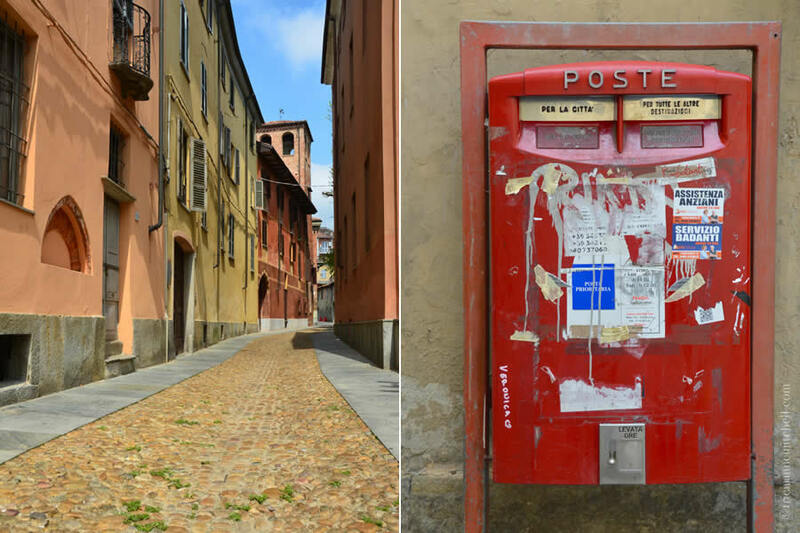 You can imagine how I felt being surrounded by Piedmont’s aesthetically-stunning scenes. Suffice it to say that my camera was working overtime. :) Here’s hoping your week is off to a terrific start! Thank you, Dlacson. Many details in these pretty surroundings caught my eye. Now that autumn is just around the corner, I would love to return and see the vineyards wearing fall colors! Hi Kamal, I also loved Asti’s hodgepodge of architecture, and the manner in which different styles are juxtaposed there. 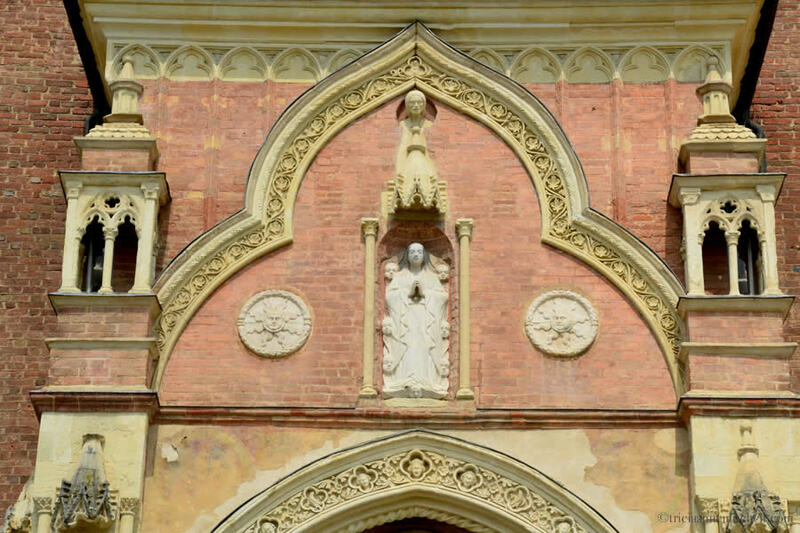 One classic palace which we saw is now abandoned, but it was fascinating looking at its outer wall, which featured the remnants of about 6 generations of windows: some arched, others rectangular, half of them now filled in with bricks. That made it fun to imagine what the series of residents were trying to achieve inside the house, how home technology has changed throughout the centuries, etc. India also has some intriguing architecture! What are some of your favorite towns or cities to explore there? It’s surprising to hear that the locals shut up shop and go on holidays in August. I would have thought it would be the busy time for tourists. Lovely photos Tricia. Carol, I agree! I suppose it illustrates how the Italians take their work-life balance very seriously. :) When I went to Paris for the first time, back when I was 16, I recall a fair number of shops being closed there in August too. I’m not sure if that’s still the case in France now. We have found many businesses closed for August here in Spain as well. We live in a beach town so it is very busy with vacationers from the big cities and other EU countries in August. Many businesses that rely on the tourist trade are open but regular offices etc. are not. Spending time with family is very important to the Spanish people. The pictures of this part of Italy are amazing and the food makes me hungry. Hi Darlene, I wonder if the August closures are common in the Mediterranean countries? Catching glimpses of these dishes makes me hungry as well. One of my favorite Piemonte dishes was the risotto: the savory varieties, even lightly sweet, creamy ones. In an upcoming post, I’m going to share the recipe for a very special risotto, which we enjoyed at dinner. I’m thrilled the chef was happy to share it. Speaking of food, I’m curious what some of your new favorites in Spain are, since you’ve lived there for a while? It seems you and I both like rice dishes as I love the paella found in the Valencia region. When it is hot, there is nothing like gazpacho to cool you down and I enjoy Spanish Tortilla. I don´t eat meat but the local fish is often very good and there is an abundance of fresh fruit and vegetables year round. I am still trying things. Darlene, it sounds like we have really compatible tastes. Coincidentally, one of Shawn’s favorite dishes to cook is a Spanish Tortilla, something he just made yesterday. (One of the keys is having a large plate onto which to flip the tortilla.) And Gazpacho – ever since we enjoyed it in a park café on a sizzling day in Sevilla, I’ve been meaning to try and make it ourselves. Cocoa’s mother whipped up some in Switzerland, and it was refreshing and tasty. I love also the art in italy specially their furnitures. Dlacson, I must confess that I haven’t paid as much attention to Italian furniture as I have the architecture and works of art. Yet a simple country home in Tuscany or Umbria (perhaps most anywhere in Italy for that matter) outfitted with Old World furniture blended with sleek Italian design does sound enticing. Is there any specific furniture that you most appreciate from Italy? Yes the chair with wood curvings and it is alway looking grand and the reputation of “made in Italy” is known all over the world. Not to mention arts too. When my husband and I went to Italy, my foot got blisters because of long walk and end up buying a sandals which last for so many years, I bought it in Venice near the church. Made in Italy is really durable. What a lovely and functional souvenir they must have been! I recall having the same problem when I was in Barcelona some years ago. The pair of shoes I purchased there ended up lasting me nearly a decade. They became my go-to travel shoes because they were so comfortable. Tricia I love to cook and truffles are very expensive its pungent aroma makes the food appetizing. This is rare that makes it expensive. How about culkturing it? cloning perhaps. I’ve not yet tried white truffles; that’s on my must-experience list, though. Did you enjoy them in Italy? You must be a talented chef! Tricia, your post on the Piedmont region of Italy is so thorough, you have left no beautiful stone unturned. I feel as though I could visit and be completely prepared if I brought your travel guide. I’m amazed by your photographs, especially your food photos…they are quite good! Hi Elisa, grazie mille for your high praise; that means a lot coming from a talented photographer such as yourself. When food is well presented (as it was here), and the lighting is good, that makes the food photos a bit less difficult. Still, I find food photography to be the most challenging, and I’m constantly trying to soak up pointers to help improve. Regarding Piedmont, I hope you’ll get the chance to explore the region someday. We missed its rice fields, the medieval Palio horse race, and a cooking class, so I have a distinct feeling we’ll be back in the near future. No I’m not a chef its only one of my hobbies The truffles is somewhat giving flavor to the food. It has a pungent aroma. Rosemarie, how special that the cascina still belongs to the family! Do you know its approximate age, and when it was last inhabited? Of course it all sounds quite romantic, and I now have a flurry of questions. I wish you a wonderful Wednesday in Piemonte, and say grazie mille for your kind words about the set of images. Oh, that’s fascinating, Rosemarie! It sounds like a wonderful blog post in the making, chronicling the restoration of the property. 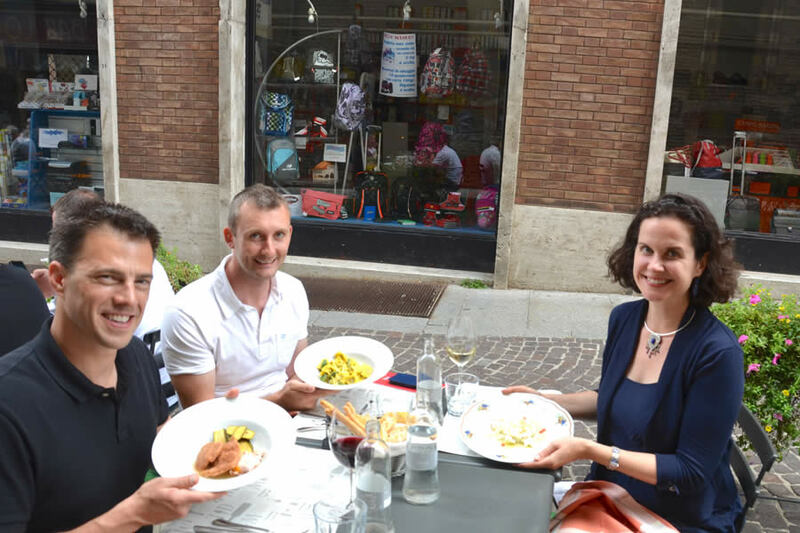 Randall, you’re spot-on in saying that the special tastes of Piemonte made it hard to leave! Knowing that the grape harvest and truffle season were just around the corner made us want to stay just a few days or weeks longer, but Malta ultimately called and we answered. :-) Hope you are well, presumably back in Asia now? Another wonderful reportage. I am from Piemonte. I hang one every little details of this post ad all the one about Italy. I will never be able to go back, but you bring my homeland to me and I thank you. Thank you once again, dear Vera. 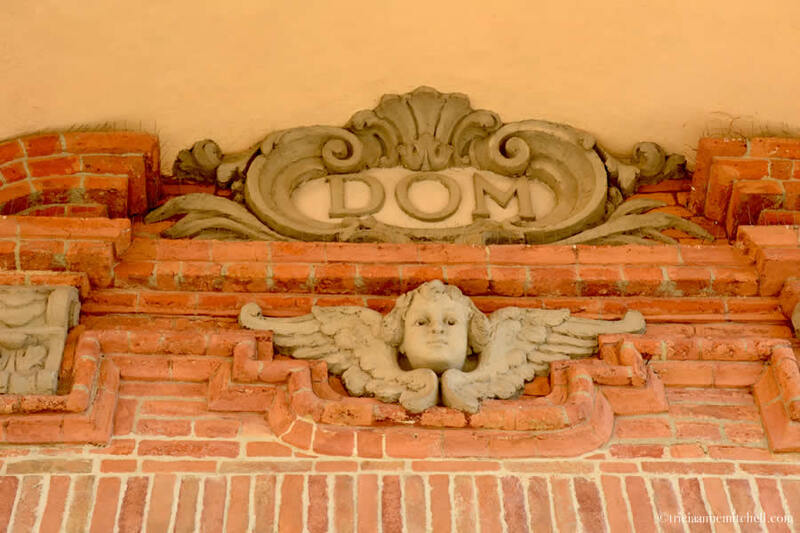 From what part of Piemonte are you? 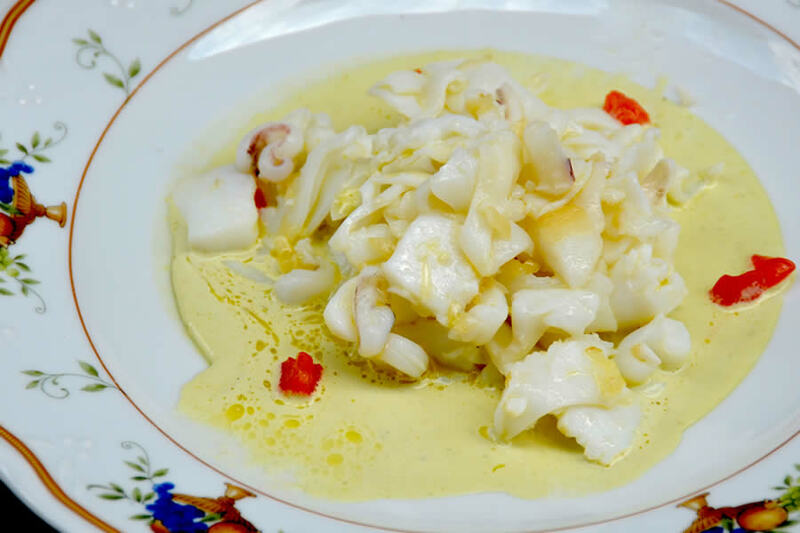 What Piemontese dishes and places are your most beloved? Certainly, I hope that you may have the chance to return. 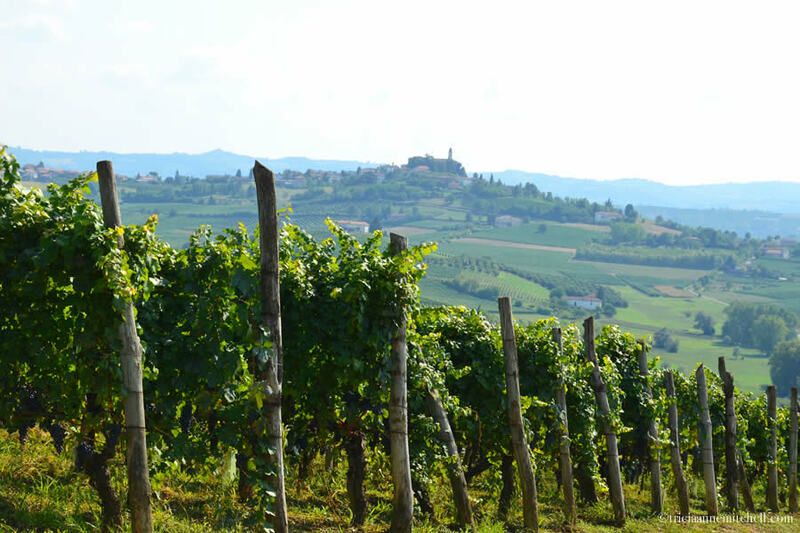 If we beat you back to Piedmont, we will toast to you over a glass of Barolo or Barbaresco. :) I would also like to learn how to make a Torta Nocciola and some of the region’s fantastic risotto dishes. Hi Tricia: I was born in Torino, Piemonte. My father had a property in the Vercellese, near the Langhe. I lived in Torino until it was time to leave home … then I lived in Saudi Arabia on the Persian Gulf. It was a good experience in view of what happened later! I saw the last of the American petrol colonies in Saudi before coming to the US. 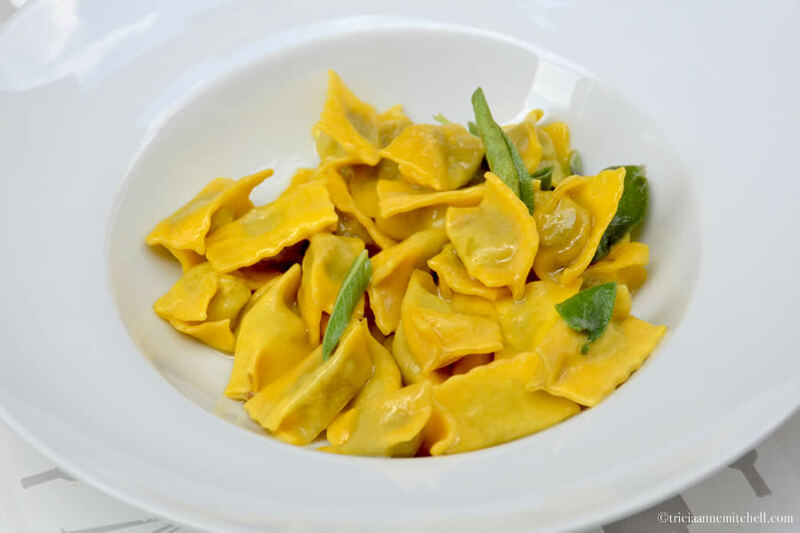 My favorite dish from Piemone is agnolotti – very rare to find in the USA. I do not know how to make torta di nocciole (though I could invent it ). Risotto I can make and it is delicious, cotoletta alla milanese, hare stewed in barolo, pheasant in cream sauce, sweet and sour meatballs, omelette confiture, zabaglione, scaloppine al marsala, or al limone, and other things that generally are part of each family’s individual cooking, which varies. I am an old lady now, I live alone, am not well, I have very little strength left so my cooking is reduced to minimal one-plate dishes that can be made in 1o minutes. A lot of my cooking derives from experience, almost none from precise recipes. You encourage me to think about writing some cooking stuff for you! but it may take me time. Please see my email in the Avatar and send me yr. email. I’ll see what I can do to put together some suggestions for your cooking. How about fennel in red wine zabaglione..? Hello again Vera, from Italy, to the United States and Saudi Arabia, it sounds as though you have many fascinating stories to share. I have not seen enough of your birthplace, Torino, but I would like to explore the city more. 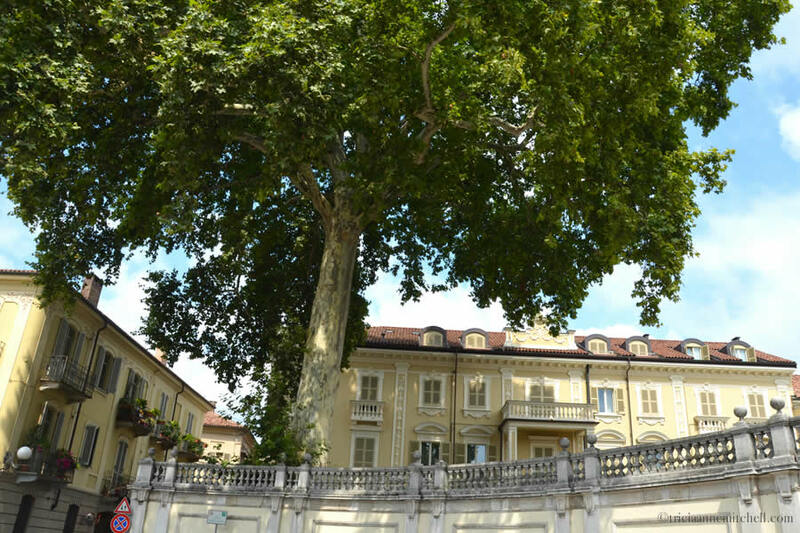 When I was about 16 years old, our French exchange student’s family took my mother and me to Turin for an afternoon. That was my first time stepping foot in Italy, and I still remember the tasty pasta, and Turin’s grand arcades. In 2006, my mom and I would return to Torino for the Winter Olympics too. I am touched that you would like to share some of your family’s treasured recipes with me; mille grazie! The Fennel in Red Wine Zabaglione sounds intriguing, and I would be honored to try making your recipe. I have touched base with you by email, Vera. Until next time, wishing you a beautiful day filled with sunshine.